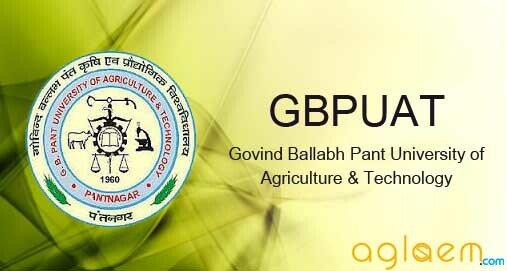 GB Pant University of Agriculture and Technology releases an official notification for admissions in Undergraduate and Postgraduate courses every year. 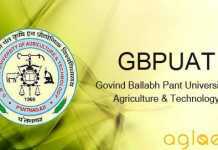 The admission to these courses is done on the basis of an entrance exam known as GBPUAT. The admission to M.Tech programmes will be done on the basis of GATE score and B.Tech merit. 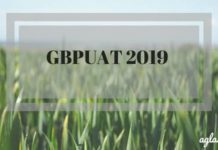 Candidates can check the details about GBPUAT Admission application process, eligibility criteria, selection process and other information on this page below. Candidates who want to pursue various undergraduate and master courses like MCA and PhD programmes should appear for GBPUAT. The entrance exam is the gateway to admission in various UG and PG courses. Candidates can fill their application form online from the official website as per the scheduled date. Admit card for GBPUAT entrance examination is made available for the candidates who successfully fill their application form. Qualified candidates, as per merit, shall be called for counselling on a specified date and time for consideration of admission. Schedule for the GBPUAT is given below. Candidates should fulfill the eligibility criteria laid down by the GB Panth University to seek admission into the various courses offered by the university. Some of the eligibility criteria are listed below. Candidate should have cleared his/her major in B.Sc. Agriculture. Candidate should have cleared his/her Intermediate Agriculture/Science with Mathematics or Biology. Candidate should have cleared his/her major in B.Sc. (Hons.) Community Science /B.Sc. (Food Technology). Candidate should have cleared his/her Intermediate with Science, Mathematics or Biology. Candidate should have cleared his/her major inf B. V. Sc. & A.H. Candidate should have cleared his/her Intermediate with Science including Physics, Chemistry, Biology and English or equivalent examination. Candidates should have obtained a minimum of 50% marks for General Category and 47.5% for reserved categories (OBC, SC & ST) in aggregate in the subjects of Physics, Chemistry, Biology and English. For B.Tech Programme – Pass in 10+2 examination or its equivalent with Physics and Mathematics and any one of the optional subjects Chemistry/ Biotechnology/Computer Science/ Biology. Candidate should have cleared his/her major in Agricultural Economics -B.Sc. in Agriculture/ Fisheries/Forestry/ Horticulture/ Home Sc./Agril. Marketing. Major in Agrometeorology – B.Sc. in Agriculture/Forestry/ Horticulture or B.Sc. with Physics as the major subject. Candidates should have cleared their majors in Agril. Engineering (Farm Machinery & Power Engg.) and Bachelor’s Degree in Agricultural Engineering/ Mechanical Engineering from a recognized University/Institute. Candidates should have cleared their majors in Clothing & Textiles – B.Sc. Home Science/Home Economics/Family & Community Sciences with Intermediate Science. Candidates should have cleared their majors in Plant Physiology – B.Sc. in Agriculture/ Zoology, Botany and Chemistry/ Horticulture/ Microbiology with Chemistry/B.Sc. Forestry. Candidates should have cleared their majors in Agricultural Economics – M.Sc.Ag. Agril. Economics/Rural Banking & Agril. Eco. or M.Sc. Dairy Economics/Livestock Economics/ Forest Economics. Candidates should have cleared their majors in Electrical Engineering – Bachelor’s degree in Electrical Engg./Electrical & Electronics Engg. from a recognized University/Institute and Masters’ degree in the field of Electrical Engg. from a recognized University/ Institute. Candidates should have cleared their major in Human Nutrition – M.Sc. in Foods & Nutrition/Food Science & Tech./ Nutrition/Nutrition & Dietetics/ Food Science & Nutrition. Candidates should have cleared their major in Biochemistry – M.Sc. Ag./M.Sc. in Biochemistry/ Microbiology/ Molecular Biology & Biotech./Chemistry/Agril. Chemicals /Foods & Nutrition/ Biophysics/ Biotechnology. Candidates will have to choose their exam centre while filing up the for. University will try and make every effort to assign the place of choice of the candidate. However, the University reserves the right to assign the candidate to any of the exam centre mentioned in the official brochure without any justification.The place once assigned to a candidate will not be changed. Exam centres can be changed at the discretion of the University. All candidates seeking admission to PhD Programmes shall take (i) Research Methodology (quantitative statistical methods, basic computer applications, research ethics and data interpretation) test (50%) and (ii) Subject matter test (50%). The question paper shall consist of objective type questions with 4 multiple choices. All candidates seeking admission to Masters programmes and MCA programme shall take (i) Aptitude Test and (ii) Subject Matter Test. The examination shall start with Aptitude Test and after 45 minutes the question booklet of Aptitude Test shall be taken back and question booklet for group-wise Subject Matter Test paper will be distributed as per the option of the candidates (based on their qualifying examination) and major-wise. There shall be one common Entrance Examination for admission to all Undergraduate Programmes. It shall be of three hours duration and shall consist of one question paper carrying 600 marks and would be of objective type with multiple choice. The bilingual question paper in English and Hindi will be supplied. The Admissions Committee will decide the cutoff marks for UG and Masters programmes for the academic year for qualifying the entrance examination after the declaration of the Rank-wise list of the candidates appeared in the Entrance Examination conducted by the University. For PhD programmes, the minimum qualifying marks for admission in the entrance examination shall be 50%. For PhD Programmes if the marks secured by two or more candidates are the same, the merit shall be decided on the basis of marks secured in the qualifying examination. For Masters programmes in the event of two or more candidates securing equal marks the merit shall be decided on the basis of marks secured in the Aptitude Test and then qualifying the examination. For Undergraduate programmes in the event of two or more candidates securing equal marks, the merit shall be decided on the basis of marks secured in Mental Agility then Physics, Chemistry and thereafter in the qualifying examination. In the event of tie again, a candidate with higher in age would be rated higher in merit. Qualified candidates, as per merit, shall be called for counselling on a specified date and time for consideration of admission to various Undergraduate, Masters, MCA and PhD programmes. The counselling will continue till the last seat in each programme is filled-up. Merit list will be uploaded on the University website (www.gbpuat.ac.in). The candidates are advised to see regularly the website of the University for counselling dates. No separate letter will be sent to the candidates. 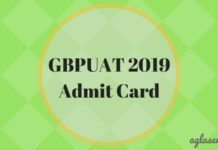 GBPUAT Admission 2019 Admit Card – Download It From Here! Clearcut announce date of councelling because many students take reservation in train .